Visiting San Antonio and looking to get a place to swim? Nice selection! Don't neglect to tell us how did it go. 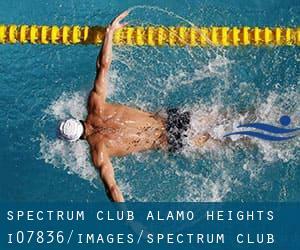 Introducing now Spectrum Club Alamo Heights swimming pool, a great swimming pool sent by a swimmer like you few days ago. Have you visit this pool? Do you work here? Please, make contact with us should you have information which you feel is gonna be helpful and remember from now on you can now promote every pool just by sharing this page with your friends or adding comments in the Facebook boxes below. Come on and assist this pool to be the first in San Antonio! Among all the activities supplied by the center, in case you are keen on swimming you will take pleasure in 25 yards, 4 lanes, Indoors. Just in case you would like to make contact with this Swimming Pool before dropping by, we only know the phone number. Do you know San Antonio? 15759 San Pedro , San Antonio , TX , USA (Postal Code: 78232). Swimmers like you reported 20 yards, Indoors. Unfortunately we do not have the email address of this Pool, but we can give you the phone number. 12002 Jones Maltsberger Rd. , S.A. Int´l Airport , San Antonio , TX , USA (Postal Code: 78216). This great and large sports center lets professional swimmers like you enjoy Olympic size, 8 lanes + 20 yards, 8 lanes + 25 yards, 8 lanes + 20 yards, Indoors. Additionally, within these facilities you can try 25 meters x 25 yards, 8 x 9 lanes, 7 feet - 13 feet depth, Indoors. Unfortunately we do not have the e-mail address of this Swimming Pool, but we can give you the phone number. Updated on 2019 8400 N. Loop 1604 W , San Antonio , TX , USA (Postal Code: 78249). Swimmers like you reported Olympic size x 25 yards, 4 feet - 7 feet depth, Indoors. Unfortunately we do not have the email address of this Swimming Pool, but we can give you the phone number. 1213 Iowa Street , San Antonio , TX , USA (Postal Code: 78203). Swimmers like you reported 25 yards, Indoors. Unfortunately we do not have the e-mail address of this Swimming Pool, but we can provide you with the phone number. Updated on 2019 7700 Jones Maltsberger , San Antonio , TX , USA (Postal Code: 78216). Swimmers like you reported 25 meters x 15 meters, 5 lanes, Indoors. Unfortunately we do not have the email address of this Pool, but we can give you the phone number. 6900 Broadway , Alamo Heights , San Antonio , TX , USA (Postal Code: 78209). This sports center offers 25 yards, 6 lanes, Indoors. For this Swimming Pool, only phone number is number here. Updated on 2019 7001 Culebra Rd. , San Antonio , TX , USA (Postal Code: 78238). This sports center gives Olympic size, 9 lanes, Indoor/Outdoor. For this Swimming Pool, only phone number is number here. 5819 N.W. Loop 410, Suite 150 , San Antonio , TX , USA (Postal Code: 78238). Among all the activities offered by the center, if you are considering swimming you are going to delight in 25 yards, 4 lanes, Indoors. Just in case you want to contact this Pool just before dropping by, we only know the phone number. 1430 West Cesar E. Chavez Boulevard (formerly West Durango Boulevard) , San Antonio , TX , USA (Postal Code: 78207). Swimmers like you reported Olympic size x 25 yards, Indoors. Unfortunately we do not have the email address of this Pool, but we can give you the phone number. 12500 N.W. Military Highway , San Antonio , TX , USA (Postal Code: 78231). This sports center offers 25 meters, 8 lanes, Outdoors. Contact knowledge for this Swimming Pool for example phone number and email address are number. 6418 Bandera Rd. , San Antonio , TX , USA (Postal Code: 78238). Swimmers like you reported 20 yards, 3 lanes, Indoors. Phone number and e-mail address are number for this Pool. 4555 Walzem Rd. , San Antonio , TX , USA (Postal Code: 78218). This sports center provides 20 yards, 3 lanes, Indoors. Contact details for this Swimming Pool for instance phone number and e-mail address are number. 100 Crossroads Boulevard , San Antonio , TX , USA (Postal Code: 78201). Among all the activities supplied by the center, for anyone who is interested in swimming you are going to appreciate 25 yards, 3 lanes, Indoors. If it is advisable to contact this Swimming Pool, email address and phone number are both number. 7460 Callaghan Rd. , San Antonio , TX , USA (Postal Code: 78229). Among all the activities provided by the center, if you are thinking about swimming you will get pleasure from 20 yards, 3 lanes, Indoors. Just in case you wish to contact this Swimming Pool before dropping by, we only know the phone number.